We have extensive experience of conducting preclinical diabetes studies in a variety of different rodent models of both type 1 and type 2 diabetes. We have a long track record of creating impact for our customers, when it comes to working with difficult models such as ZDF rats and db/db mice as well as quantitating beta-cell mass and other histological-pathological endpoints of diabetes. Our scientific expertise within diabetes, combined with our effective CRO experience, provide solid data on which to base decisions. Furthermore, we have a high availability of animal enabling us to accelerate studies. Please get in touch if you are interested in discussing how to get started with your study. We have experience with several of the models available in the market. Here you can get an overview of the phenotypical features of typical type 2 diabetes models at Gubra. 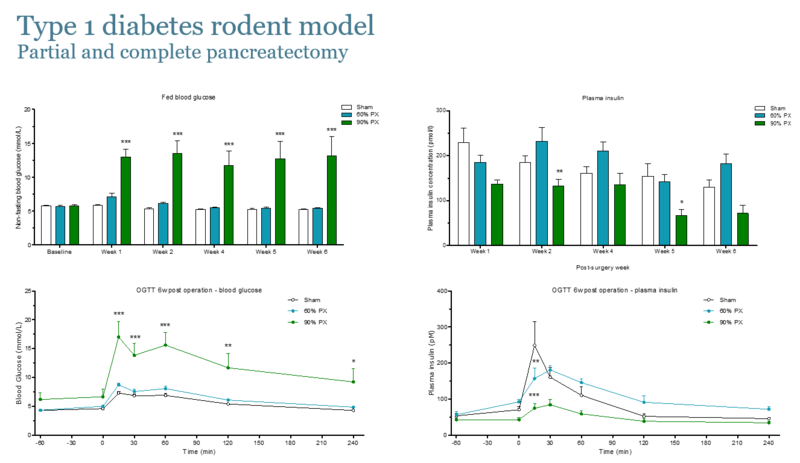 The Gubra pancreatectomized (PX) rat is hyperglycemic from the time of PX and is ideal for anti-diabetic pharmacological testing and for modeling diabetic complications. Our research has shown that the db/db mouse model is preferable for evaluating the potential proliferative effects of various interventions (pharmacological and non-pharmacological). Thorough knowledge of the ZDF rat model is a must if you want to optimize your study design in accordance with drug type and mode of action. Take a look at our film on the subject to learn more about how this model can be used. In a mode of action study we offer e.g. In a chronic efficacy study we offer e.g. In an acute efficacy study we offer e.g.